Prayer is as essential to the Christian life as breath is to our physical life. Many of God’s people are sometimes at a loss about how to pray. When it comes to the part of prayer in which we ask God for things we approach it like it is a shopping list for our own personal interest. If a visitor from another planet came to check out what serving God is all about by secretly observing the prayer life of Christians (prayer is our communication with God) he would probably conclude that God’s sole purpose of existence is to stand ready to grant any personal wish that His people have. God’s design for prayer is much bigger than that. 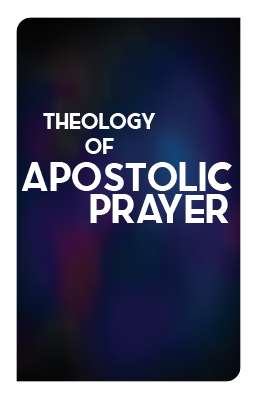 “Theology of Apostolic Prayer” will help us explore what God’s intention is for prayer connected to His purpose revealed in the Bible and the apostolic writings. It also contains a lists of all the prayers prayed by the apostles to give us a guide for things God’s wants us to seek Him about prayer.